What should a patient observe once the stax finger splint has been removed? What is the time window for an affected digit to remain immobilized in a stax finger splint? 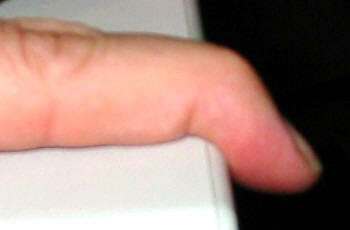 A patient should allow six weeks of immobilization in a stax finger splint. If the immobilization for any reason did not begin within the first days after the injury occurred, it is highly recommendable to prolong the immobilization period by one or two weeks to be on the safe side while allowing the extensor tendon to fully restore itself. Many people will experience the first few weeks after the stax finger splint has been removed with great insecurity. Minutes, in some cases seconds after the removal of the splint took place will suffice to reveal that the distal phalanx cannot be fully stretched as expected. The image shows an extensor tendon rupture that has been treated with a stax finger splint. The picture was taken one week after the splint was removed. You will notice the limited ability of the finger to stretch-out as well as the swelling and redness above the distal interphalangeal joint of the digit. Stretching deficits of fifteen to twenty degrees are not uncommon even after an immobilization period of six weeks, many times along with swelling and redness above the distal interphalangeal joint. Since the patient frequently also experiences pain he/she may think that the extensor tendon did not heal properly and the entire immobilization endeavor was invain. Place the injured finger above the edge of a table and bend nothing but the distal interphalangeal joint as far as possible. Now out of this extreme bending position try to stretch out the finger. In the case pictured here a stretching position could be achieved even if with some limitation!